The parish of Archangel Gabriel has existed as a mission in Ashland since the late 1980’s. For most of that time, our community has worshipped in a small rental space at the Newman Center at the SOU campus in Ashland, OR. Over the last few years the parish has grown significantly, and the facilities at the Newman Center has become increasingly inadequate for the growing number of parishioners and Divine Services. In 2013, Fr. Andreas, together with the Parish Council and a building committee, started investigating a property right by I-5, which seemed very promising. Research commenced, as well as conversations with the property owner. In the summer of 2014, a parishioner offered to give the parish a personal, interest-free loan in order to purchase the property. A contract was written and agreed upon between the property owner and the parish. After several months of working with Jackson County (to get approval of the building project), and meeting neighborhood concerns, the property was finally purchased on December 22nd, 2014 (feast day of St. Anastasia of Rome). On the Sunday of St. Mary of Egypt, 2015, the loan sum was generously waived, and the property given to the parish! This has provided an excellent foundation for our building project. 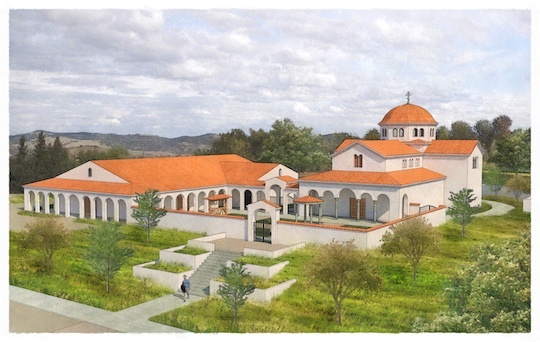 The goal of Archangel Gabriel Orthodox Church is now to build an Orthodox temple on the property, develop the land (with a community garden, playground, an orchard, a cemetery [“Holy Dormition Cemetery”, under development] and various landscaping projects), followed eventually by the construction of a trapeza (“fellowship hall”). In order to complete this project, your prayers and contributions are greatly needed! If you are interested in donating, please do not hesitate to contact us. If you are curious to find out more about the progress of the building project, you can find the latest news here.